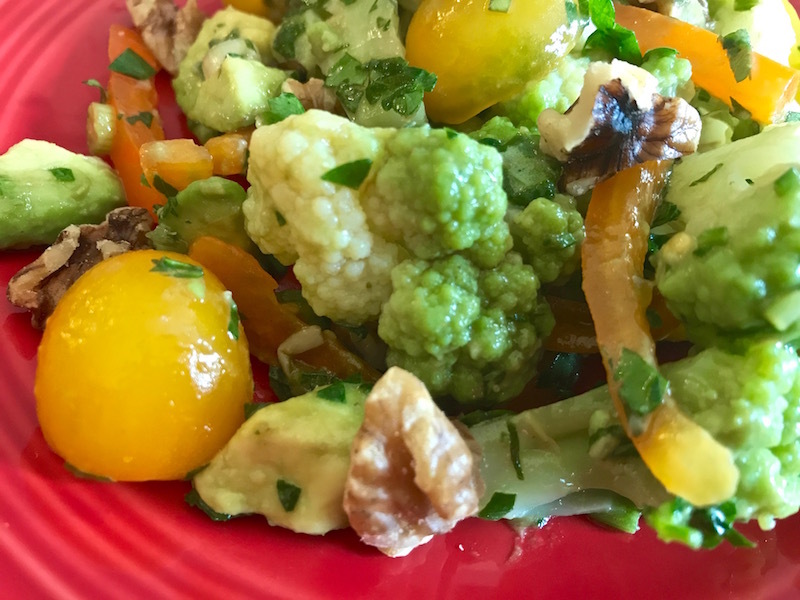 Cauliflower, Tomato, and Avocado Salad | Keep It Up, David! I love salads. I eat them all the time. Sometimes, though, I get a little tired of lettuce and other salad greens, so figuring out a delicious non-lettuce salad is always fun. 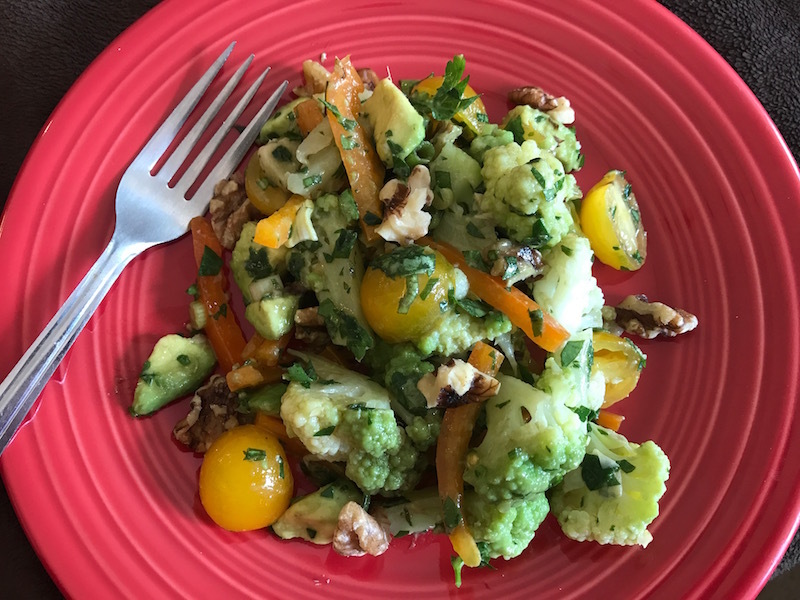 And I came up with a great one: Cauliflower, Tomato, and Avocado Salad! I also love oddly-colored vegetables: rainbow carrots, purple asparagus… it’s all intriguing and delicious. So when I saw green cauliflower at the store, I knew it would make a great star ingredient for a lettuce-free salad. 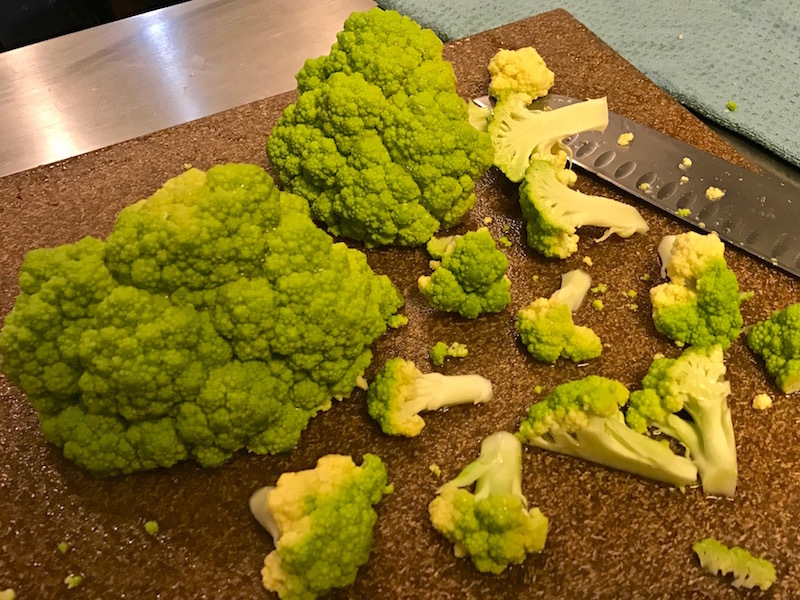 Sometimes these are called green cauliflower, and sometimes broccoflower. 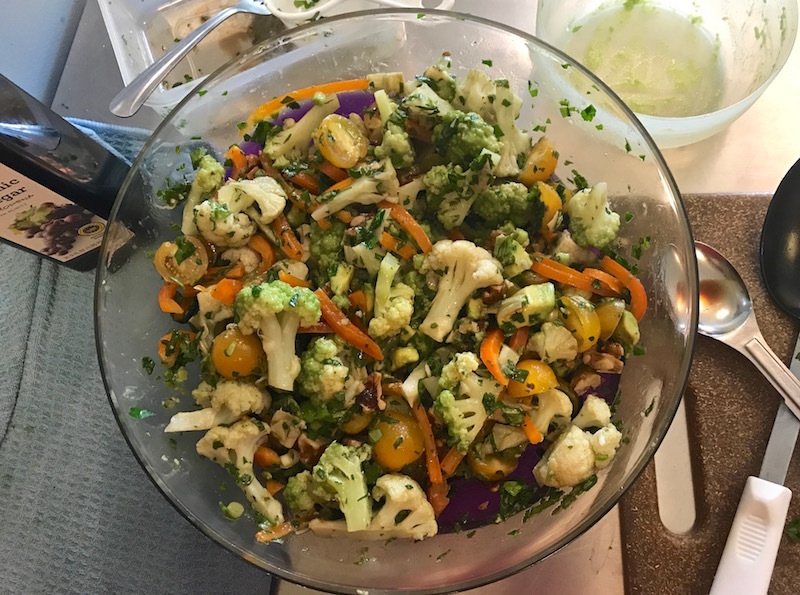 The green cauliflower wasn’t very big, and I was taking this salad to a gathering, so I bought a regular white cauliflower too. Cut both into bite-sized florets. 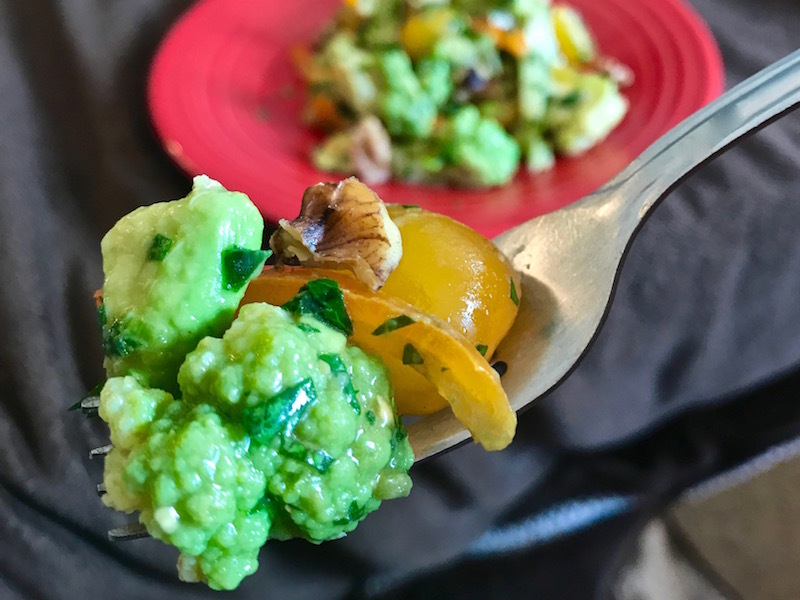 You need 6 cups of cauliflower florets for this recipe – I split that half and half between the green and white. 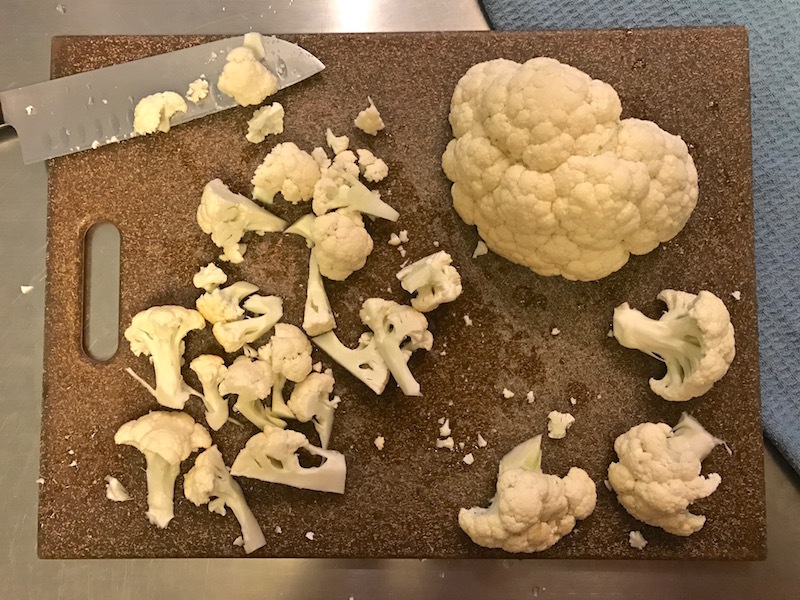 Steam the cauliflower. I used my Richard Simmons Steam Heat machine. You want it tender but not mushy. Mine took 15 minutes, but that might vary based on floret size. As soon as they were done cooking, I ran them under cold water to stop the cooking and cool them down. 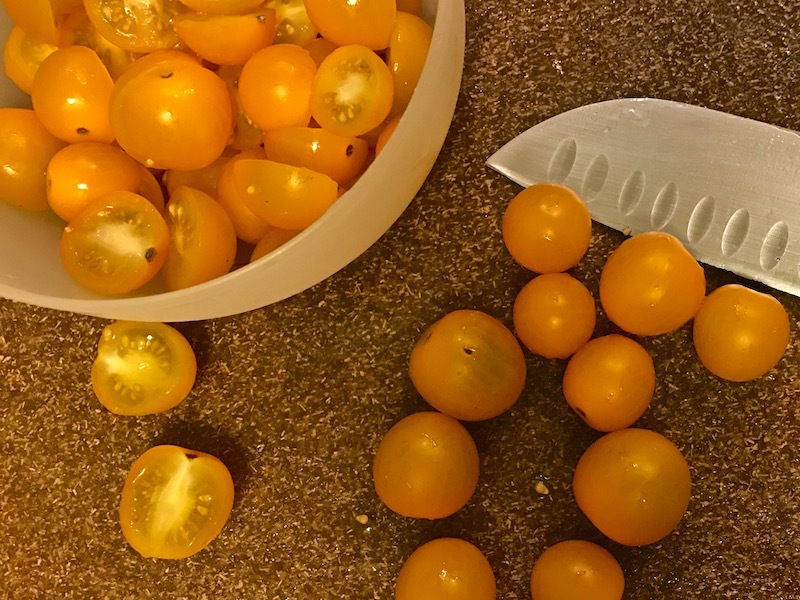 1.5 cups of halved cherry tomatoes. These golden ones looked better than the red ones at the store, so I got them. 2 medium avocados, cubed. Put the pieces in a bowl, and toss them with 2 tablespoons lemon juice (or the juice from 1/2 a lemon). The acid will keep the avocado from turning brown. 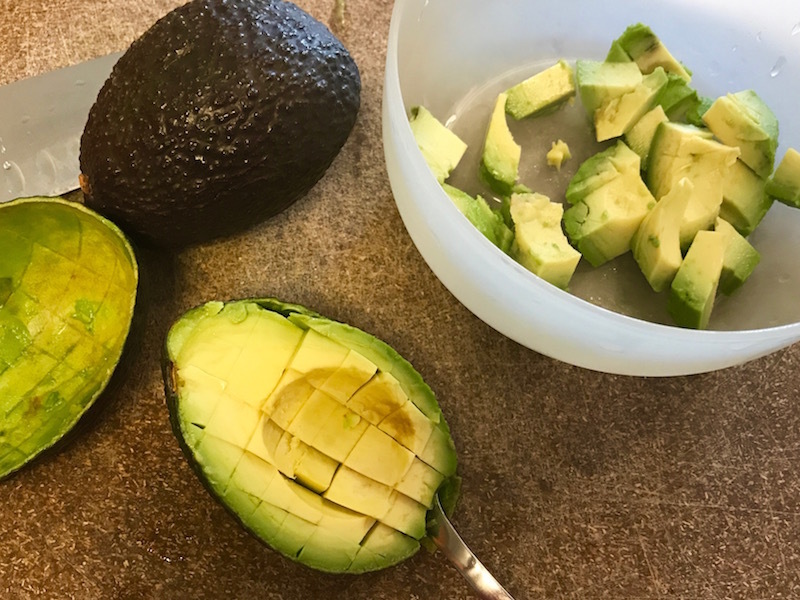 Make sure every piece of avocado gets a little lemon juice, and then add the avocado and juice to your big bowl. 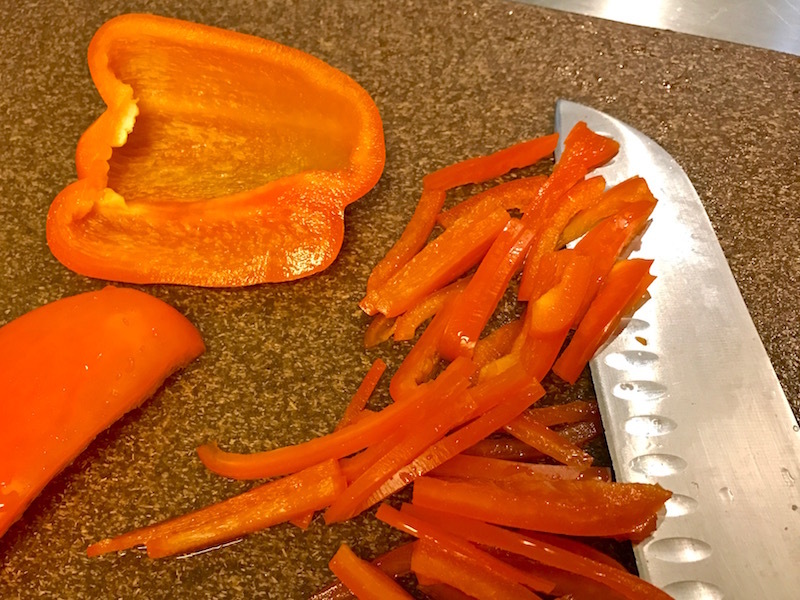 1 cup orange bell pepper, cut into small strips or cubes. 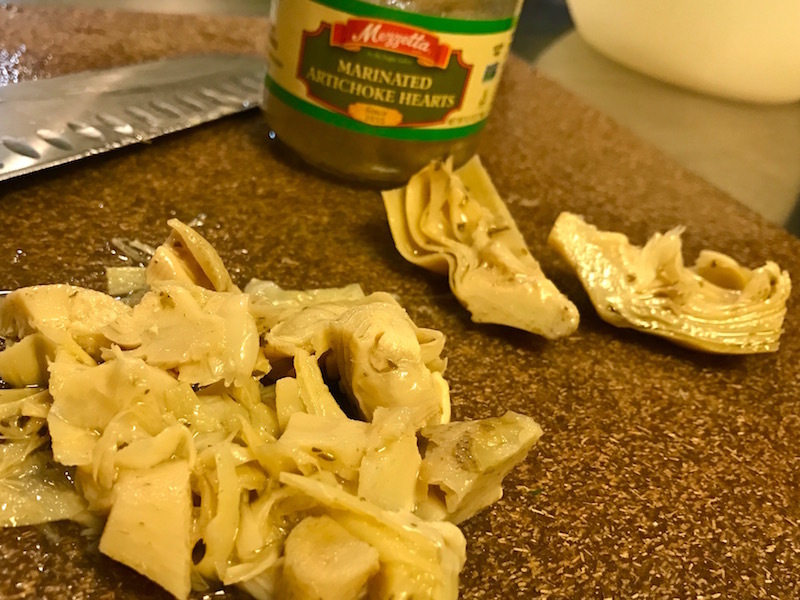 1/2 cup marinated artichoke hearts, chopped. 1 bunch green onions, chopped (just the white and light green parts). This ends up being about 1/3 cup. And I already added walnuts to the salad, which is why I didn’t add any to the dressing. 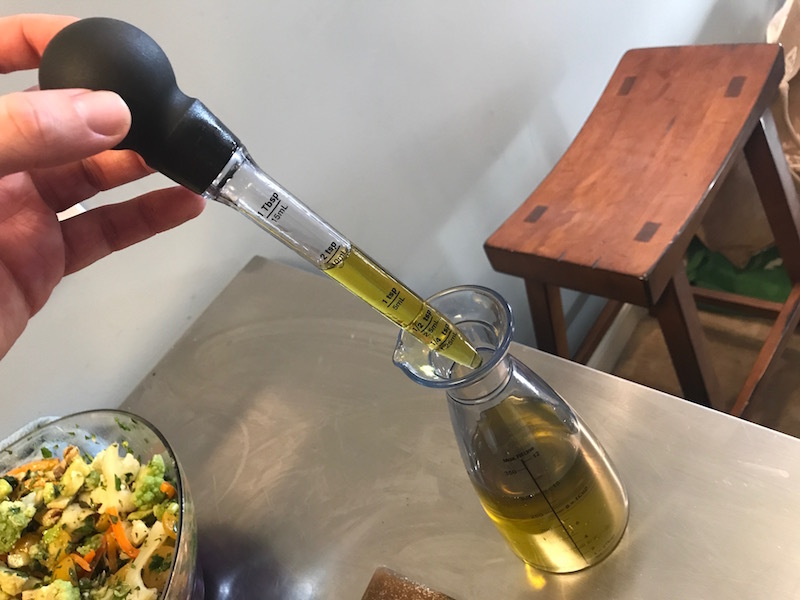 Check out this cool oil decanter that my sister Laura got me, with a dropper that makes it so simple to measure out tablespoons of oil. Toss it all together, and your salad is ready for consumption! Crisp, crunchy, tangy, fresh, light, bright – all the good salad adjectives. 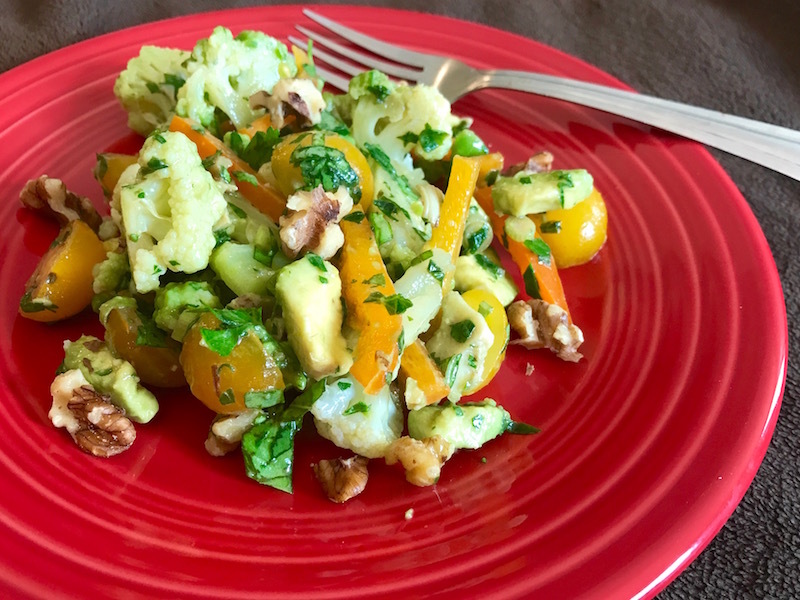 One cup of this salad is about 170 calories, with 14g fat, 10g carbs, and 3.5g protein. Very good for you! Want more healthy recipes? I got a slew of them on my Recipes page! This entry was posted on Tuesday, April 4th, 2017 at 12:23 am and is filed under Uncategorized. You can follow any responses to this entry through the RSS 2.0 feed. You can leave a response, or trackback from your own site.